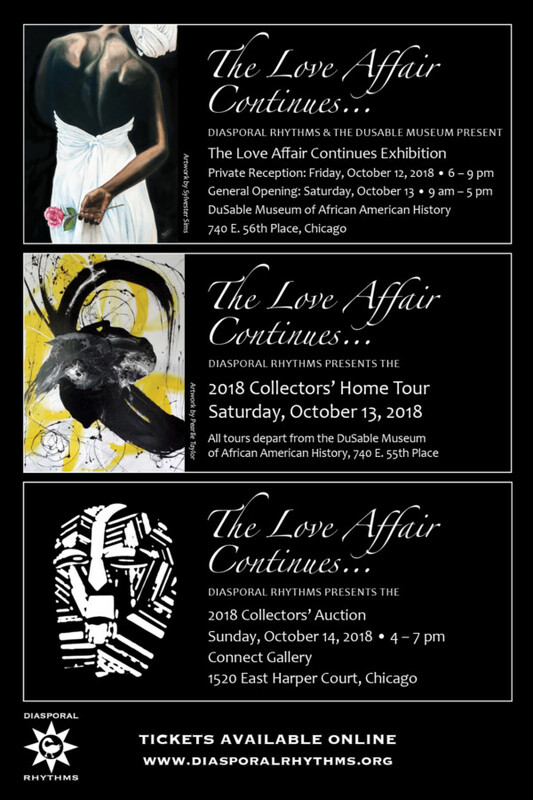 The Love Affair Continues… is part of the 15-year anniversary celebration of the founding of Diasporal Rhythms, a Chicago-based collector group. Diasporal Rhythms is a group of collectors passionate about art of the African Diaspora. Founded in 2003, the group seeks not only to collect art, but also to educate the public about the value of collecting art by living artists. Every five years, the group showcases the best-loved artists and artworks from their respective collections. This year’s exhibition features works by over 40 artists in a broad range of media, including drawing, painting, sculpture, and photography. By cultivating relationships with living, local artists of color, Diasporal Rhythms provides patronage and support for talented, often overlooked artists, bringing them into a broader sphere of reception. This exhibition is their continuing love affair, a paean to Chicago’s vibrant creative community.